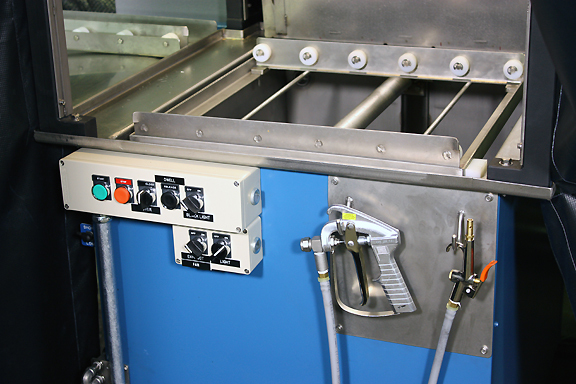 The system below incorporates a complete semi-automated FPI system with post cleaning. The application is for a water-washable penetrant as per ASTM E 1417. 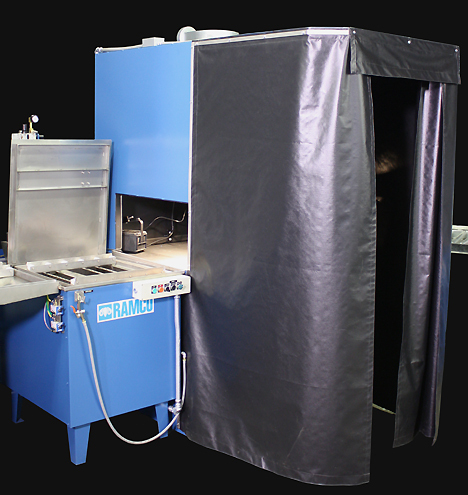 The process consists of nine steps – Penetrant, Dwell, Spray Rinse, Hot Air Dry, Dry Developer, Inspection Booth, Post- Cleaning (Wash-Rinse-Dry). 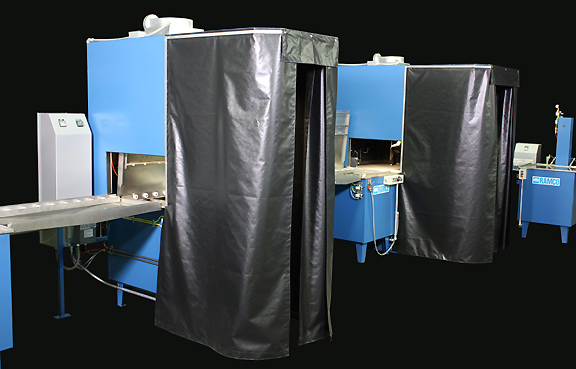 Viewing booths are built for both the spray rinse and for final inspection operations to ensure accurate penetrant removal as well as visual inspection. The line runs left to right and processes a wide variety of aerospace components loaded into baskets placed on a transport elevator. This semi-automated line uses standard RAMCO elevator within each processing chamber. The elevator is used to transport the work into and out of the chamber but its most important function is to continuously move the work as required within selected processing zones. This function is especially effective in the spray rinsing, drying prior to developer, and all post cleaning operations. The baskets are placed on the first transport elevator of the line. From that point on everything is transferred over roller conveyor sections – there is no lifting/lowering required. The FPI rinsing module includes strategically placed spray headers (specific nozzle locations and patterns) with zoned platform oscillation between the headers to effectively remove penetrant. Adequate hot water is brought to the system within the temperature and pressure limits set by the specifications on penetrant removal. Water detailing and air blow-off guns are use to ensure that any final traces of penetrant and excess water have been removed. Next in line is a RAMCO Hot Air Knife Dryer. The key to the drying process is using the elevator to produce changing flow patterns. This in turn results in a dynamic drying mode (i.e. platform oscillation combined with high volume hot air flow) that allows for better drying at lower temperatures. See dynamic flow combination for further information. After drying the basket is transferred to the Dry Developer Cloud Burst module with integrated dust collector and then into the adjacent Inspection Booth as shown below.